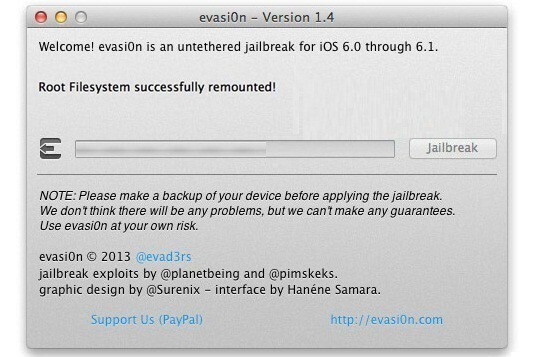 A few hours after the release of iOS 6.1.2 firmware, the well-known Evad3rs team released Evasi0n 1.4 to jailbreak iOS 6.1.2 firmware on all Apple devices, excluding the Apple TV 3G. This iOS 6.1.2 untethered jailbreak guide will show you how to use Evasion 1.4 to jailbreak iOS 6.1.2 fully untethered on your iPhone 5, 4s, 4, iPod touch and all iPad models. iOS 6.1.2 firmware doesn’t include any new features, updating the new system is only recommended for users who are experiencing problems with iOS 6.1 / 6.1.1 firmware. If you decide to upgrade, iOS 6.1.2 can be jailbroken using Evasion 1.4 tool for your Windows, Mac OS X and Linux Computer. Step 1: Install the latest version of iTunes. Step 2: Update your iPhone, iPod touch or iPad on iOS 6.1.2 via iTunes. You can download IOS 6.1.2 firmware from our download section. Step 3: Download Evasi0n 1.4. Step 4: Connect your device to your computer, open iTunes and backup your data. Make sure your Passcode Lock option is disabled, if not go to Settings -> General -> Passcode Lock -> Turn off password. Step 5: Launch Evasi0n and click on the “Jailbreak” button. In this step evasi0n will make an injection and automatically reboot the device. Step 6: When evasi0n will show the message “To continue, please unlock your device and tap the new ‘Jailbreak’ icon“, unlock your device, and look for a new icon named as “Jailbreak”. Tap the icon just once. Step 7: The Jailbreak process continues to work in background. When you see the message Done! You can close the application. 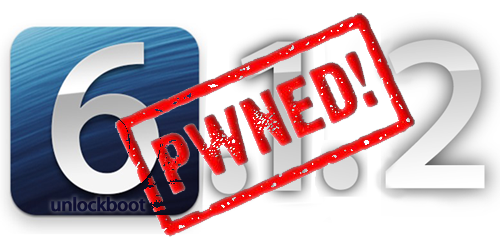 Now your iPhone, iPod or iPad will be rebooted. Step 8: In this final step, your device will reboot again and after rebooting your device is jailbroken. That’s it! You have successfully jailbreaked iOS 6.1.2 on your device. Now you can unlock the device and launch Cydia from your springboard.